Mason & Hanger maintains an ISO 9001:2015 certificate for our Virginia and Kentucky offices. As the basis for our quality management system, the International Organization for Standardization (ISO) certification is the framework for improving and maintaining our processes to achieve optimal customer satisfaction. Achieving ISO 9001:2015 certification demonstrates our dedication to the continual improvement of service and product quality. ISO 9001:2015 is implemented by over a million organizations in 176 countries. Mason & Hanger is committed to the mission of building a more secure world. This is achieved by meeting our clients’ needs through expertise, access, agility, experience, and empathy for these needs. M&H is committed to complying with the requirements of and continually improving the effectiveness of the quality management system to achieve their mission. Providing valuable and innovative solutions to complex, technical, and project management goals and challenges. Offering consistent quality by employing standard practices, tools, and technologies. Maintaining a staff of design professionals with wide-ranging experience and knowledge who are committed to company growth through customer satisfaction, continual improvement, and professional development. Our staff works every day in an environment where security is a priority – security in the design of facilities, security of information, and security of personnel. 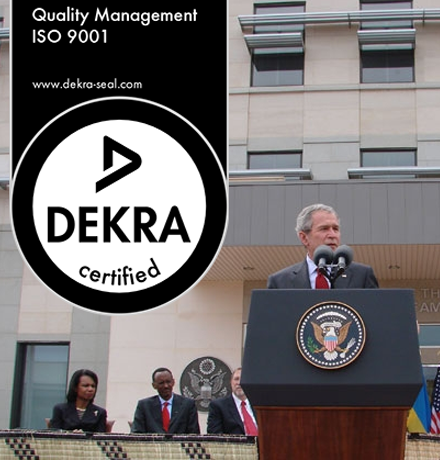 With our focus on mission critical government facilities, it is vital to manage our operations under ISO 9001 certification standards.